According to the informations provided me by UGO MUFFOLINI (the fine folk webmaster of WWW.BERETTAWEB.COM), the BERETTA M9 DOLPHIN semiauto combat handgun is not an "original" Beretta product, but a custom modification by a small USA manufacturer. Mr. Muffolini told me to have seen it in a SHOT SHOW, some years ago (he remembers in New Orleans... is it possible? ), and to have tried to acquire it, but it fires the .9x19-Parabellum round, so he would not be able to do so (ok, at least... I suspect mr. Muffolini to be a BERETTA employee, so maybe he would have been able to get it in order to add it to the BERETTA COLLECTION, placed in the BERETTA headquarter, at Gardone Val Trompia); furthermore, the M9 DOLPHIN was produced in very small number. Any further information coming from you or any other co-operator is welcome. 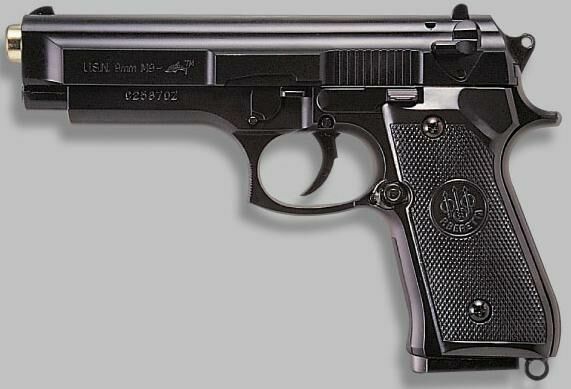 The M9 DOLPHIN is a "closed bolt" pistol (when the gun fires and the slide goes back, only the EJECTION PORT opens, not the whole barrel, as in other BERETTAs). I remember to have spotted somewhere on the web, VERY, VERY LONG TIME AGO, a picture of this gun with a 25 rounds magazine in (as the BERETTA M93-R's one). Maybe that one was just an airsoft copy, because it was from a japanese website, but, as the airsoft replicas exactly reproduce the original pieces of weaponry, is it possible that the M9 DOLPHIN was a select-fire "Machinepistol"?